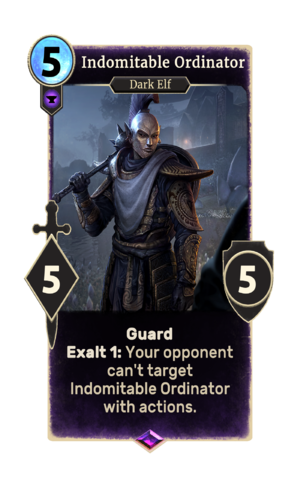 Indomitable Ordinator is an epic Endurance creature card. It is part of the Houses of Morrowind expansion. In addition to the card's availability in the Houses of Morrowind expansion, one copy is included in the Tribunal Glory theme deck. "Three gods... one true faith." "You cannot escape the righteous!" This card's exalt ability applies the Indomitable card effect. This page was last modified on 2 March 2019, at 00:28.